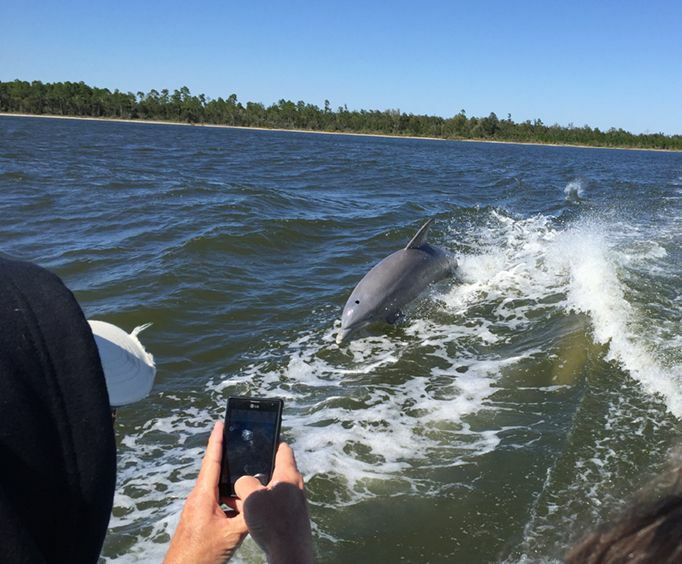 If you're out and about in Gulf Shores and are looking to enjoy a fun filled day in on the water than the Alabama Gulf Coast dolphin Cruise is perfect for you and your family on your Gulf getaway. 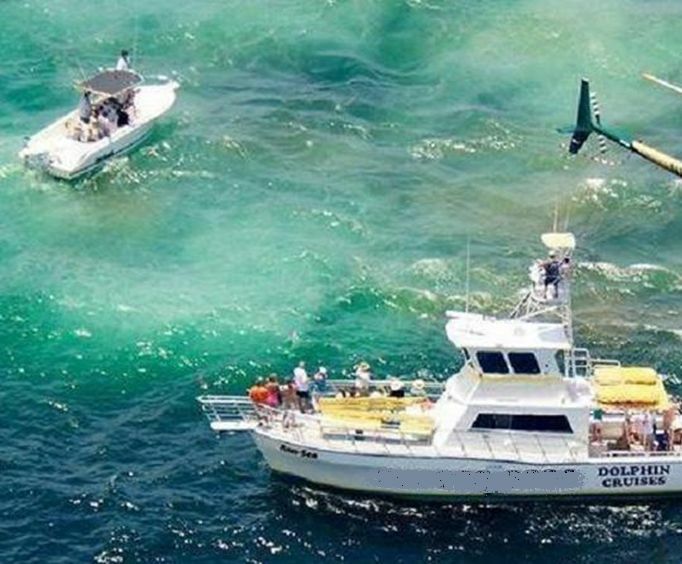 On this two hour family friendly Cruise you'll enjoy the underwater world without ever having to get wet and experience some close and friendly encounters with dolphins. When you arrive at Sportsman Marina, you'll be welcomed at the check-in booth with a smile right outside of the Pleasure Island Tiki Bar. You'll board the Ann-Sea and be welcomed by a deckhand that will help kids with life-vests. You're free to make yourself snug on either the lower or upper deck or you can roam around the boat. Unwind and enjoy the ride as you head out into the Gulf of Mexico or to the back bays. Once the dolphins are found, they'll most likely come to swim beside the boat and put on a magnificent show for our enjoyment. During the return trip will stop and pull a crab trap were blue crabs, stone crabs and starfish have been found. You'll also be shown how to safely hold each if you'd like to. During the daytime pirate have been known to appear ready to fight to the death with water pistols. If pirates are afraid to strike during the daytime than there are other boats to encounter and battle with. Don't want to get wet? No sweat. You can wait out the battle in the day cabin. The day cabin is air conditioned during the summer and offers a snack bar and a restroom. After you return to the marina the Captain will let you know all about the locals preferred restaurants and thank you for joining the Cruise. Keep in mind the deckhands work for tips, so be be kind. Once you arrive at Sportsman Marina, you will be greeted with a smile at our check-in booth just outside of Pleasure Island Tiki Bar. As you board the 50 foot Ann-Sea, the deckhand will welcome you and assist any children with life-vests. Find your favorite spot on our upper or lower decks and make yourself comfortable. You are free to move around the boat during the cruise. When the cruise is leaving the dock, Captain Scooter will give you some instructions on safety during the cruise, tell you a little bit about the area and also talk to you about how to spot the dolphin. Relax and enjoy the cruise to the back bays or out into the Gulf Of Mexico. 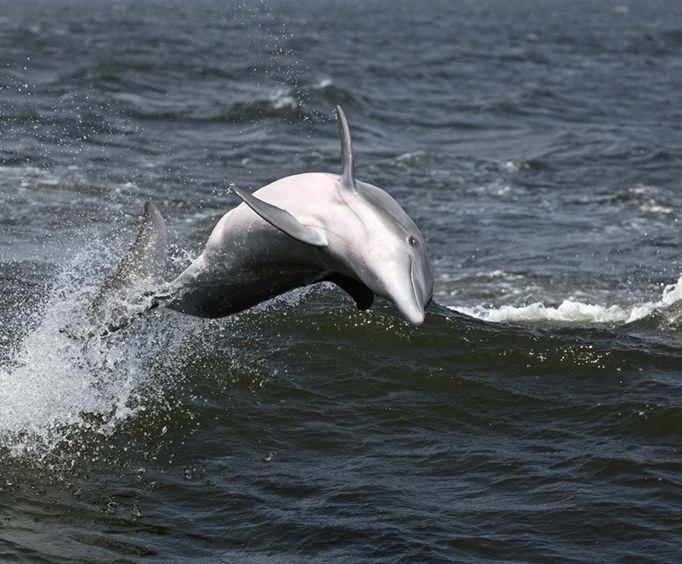 When the dolphin are located, they will usually come swim up beside the boat and put on a pretty spectacular show for us. Video is the best way to capture these fascinating mammals but we have had some customers get some amazing still shots as well. On the return trip from the back bay we will stop to pull a crab trap and see what it may hold. We have found everything from blue crabs, to stone crabs to star fish!! We will remove what is inside and show you how to safely hold it, if you choose. On our daytime cruises, we may also encounter pirates!!! Never fear, we will have a water gun battle to the death! Well, not really, just to the soaking! ;) If the pirates are too scared to be out that day, we have other boats that we do battle with as well. So, bring a towel and be prepared to get refreshed! If you don't care to get wet, we do have a cabin where you can hang out until the battle is won! Speaking of the cabin, ours air conditioned during the summer and we have a snack bar and restroom for your comfort. We have a variety of snacks and drinks in our snack bar along with a few souvenirs. You are welcome to bring a small cooler and we do allow alcohol but we do ask that you be responsible and remember that we are family friendly. We also ask that you not bring glass containers if at all possible. Upon return to the marina, Captain Scooter will tell you about all of the locals favorite restaurants and thank you for joining us. Our deckhand does work for tips so please be prepared to tip 10-15% of your trip total. Being a family owned business we rely on repeat customers, customer referrals and customer feedback to help future visitors make decisions, so we ask that you please rate our company on the sites listed in our followup email. We greatly appreciate our customers and strive to show it! Enjoyed myself immensely. The captain was informative, the boat was very nice, and we saw lots of dolphins. The battle with the pirates was so much fun. Even for us grownups.